When we get into a new port the first thing I always do is snap a couple of pictures from the balcony of our cabin. Yesterday morning my arrival photo shoot included a sight that at first struck me as charming. Alongside our ship, a small boat was bobbing in the waves. 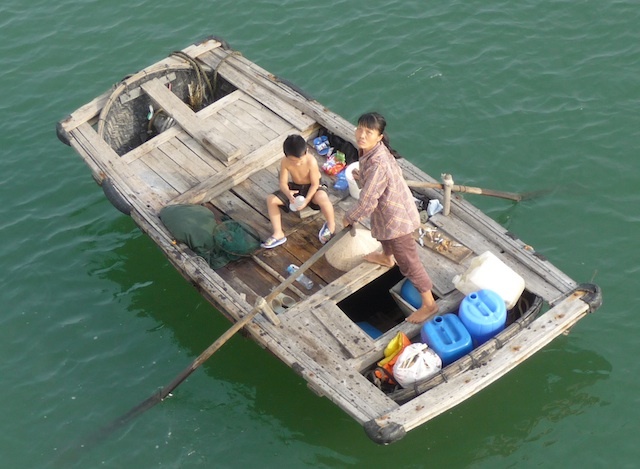 On the boat was a child and a Vietnamese woman, coolie hat and all. The woman was working the oars and the child, who couldn't have been any older than three or four, sat there looking cute. At first I thought they were just passing through, but then I realized that the woman was begging. It was still early in the morning and very few people were out and about on the ship, but whenever anyone appeared at a railing the woman would paddle over to them and raise her hand in a gesture of supplication, and then point at the child. And she'd do this with a sense of urgency. Exactly what she hoped that we would do for her was unclear. 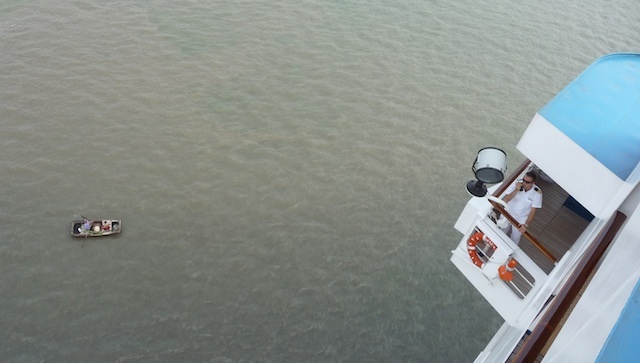 It's about a twenty foot drop from even the lowest accessible deck down to the water, and the top deck is probably seventy feet up. The water had to be deep: I'm not sure what our draft is, but we displace 50,000 tons so it has to be at least 20 feet or so, so the water must have been 30 or 40 feet deep. And this was an industrial harbor. The water was muddy. Anything that fell into the water and doesn't float was surely gone forever. I've been to a lot of poor places and seen a lot of beggars. Sometimes I give them something, sometimes not. It depends on the circumstances. If it's a lone beggar and I happen to have some change on me I'll usually give it to them. If there's a crowd I usually won't because I've found that there is a very egalitarian ethic among beggars; as soon as one gets something the other swarm around the newfound patron and demand their fair share. It can be very difficult to extricate oneself from such situations, particularly when children are involved. But this woman was clearly flying solo. I thought for a bit about what I might be able to do to help her out (and her kid) but the logistics were just too daunting. Besides, I couldn't really figure out what she wanted. Food? Money? Asylum? I decided that the situation was beyond my ability to influence in a positive way, so I hardened my heart (a handy skill if you want to travel in poor places without going crazy), and went about my business. Which included taking pictures of her. Then I helped to stimulate the local economy by going kayaking in Halong Bay, which is one of the most beautiful places in the world. It's a vast array of monoliths that have been carved out of limestone deposits by rainfall and ocean currents. There are caves only accessible by Kayak that lead into breath-taking grottos. There are hawks flying around. The place is truly awe-inspiring. Cross-breed Venice with Yosemite and you have Halong Bay. Fast-forward to our departure, about two hours ago as I write this. A crowd began to form against the railing so I went to see what the commotion was about. There in the water was the same floating beggar woman from the day before. Now, I have to digress for a moment and describe her boat. When I say it was small, I don't mean small compared to our cruise ship, I mean small on an absolute scale. To call it a rowboat would be an insult to rowboats. It was really not much more than a dilapidated wooden raft with oars. The day before, the wind had been calm. Now it was blowing at about 20 knots, and the poor woman had to paddle constantly just to stay in place. Every few minutes she had to stop and bail, and the wind would blow her back towards our stern. After bailing out a few gallons of water she'd start paddling again and with agonizing slowness work her way back to about our midship before she had to bail again. In between paddling and bailing, she would occasionally raise up her hand towards the dozens of people peering at her over the railings. But only for a split second. She was still there alongside us when we cast off. At that point I really expected her to give up, but she didn't. With 50,000 tons of cruise ship bearing down on her she kept paddling and bailing, paddling and bailing. This time it turned out we also had to turn around, but the maneuvering room was even tighter because of some nearby buoys -- and the beggar woman's boat. At one point our tug boat (there is always one standing by in case something goes wrong) had to go and chase her away. Eventually we got away from the dock and the woman and her boat faded away into the distance. She was still paddling. I don't know if the woman knew what the ship was going to do next, but it turned out that even with her out of the way there wasn't room to do the usual pirouette -- to get ourselves pointed in the right direction we had to do a three-point turn, which is quite the maneuver in a boat this big. By that time the beggar woman's boat had been blown so far downwind that it was now barely visible. She had been paddling (upwind) the whole time, and we were now headed directly towards her. She maneuvered herself almost directly into our path, and there were a few tense moments when it looked as if we might actually run her down. As we passed, she turned her boat around. But we were doing about ten knots (and capable of twenty), so although the wind was now with her, keeping up was completely hopeless. Nonetheless, she continued to paddle after us. I watched her for as long as I could, ultimately resorting to binoculars. When she finally faded from view for good she was still paddling after us, heading out into open water. What she was hoping to accomplish at that point I cannot begin to imagine. Don't ever let anyone tell you that poor people are poor because they aren't willing to work hard or take risks. Just for the time I was watching her, this poor woman had been paddling non-stop (and I do mean non-stop) in a leaky boat for the better part of an hour. God only knows how long it took her to get to us in the first place, or how much longer she had to paddle to get to a safe harbor. That is, of course, assuming she actually made it. Now that I see these I realize that the woman's boat is even more rickety than I had thought. The hull of the boat is actually made of reeds, not wood. Little wonder that it was leaking. UPDATE2: Upon closer examination of my photos, it turns out that the woman who was there when we arrived was not the same as the one who was there when we left. They looked virtually identical at a casual glance. Both had a young child with them, a boy. Both had woven-reed boats with crude wooden decks that looked virtually identical. 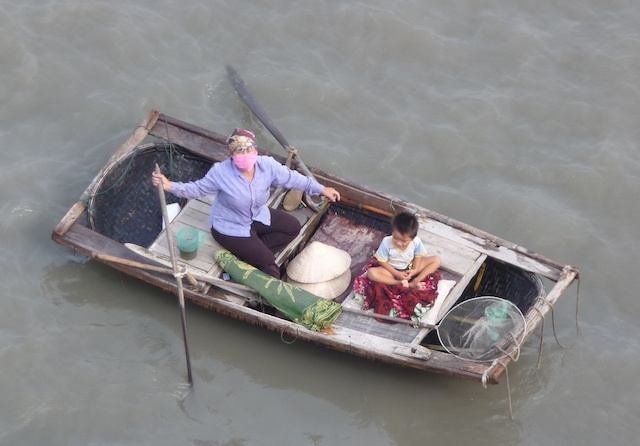 But the photos clearly show that they were different boats and different people. Here's a picture of the arrival beggar. I have since learned that the average per-capita income in Viet Nam is about $1000 per year. That's up from $220 in 1994 thanks largely to economic reforms. Could it be that the woman was finding it impossible to get back to land, and was looking for help from the cruiser? I suppose not, I want to think that on a busy port someone would have helped her. I'm sorry, I find the whole thing disturbing. It's true that our perceptions are so blunted by living among riches that we have no real understanding of what poverty is. Determination is not sufficient for having a successful life. She needs to apply that determination in the right direction. 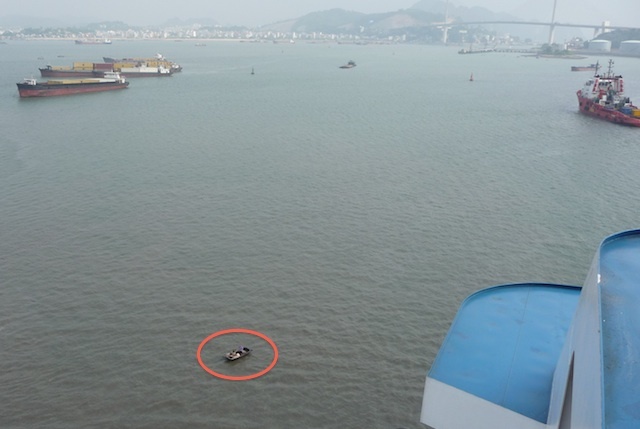 > Could it be that the woman was finding it impossible to get back to land, and was looking for help from the cruiser? No. Don't forget she was out there two days in a row, and most of that time we were docked. If all she wanted was to get out of the water she could have easily done that at any time (except towards the end of course). > Determination is not sufficient for having a successful life. She needs to apply that determination in the right direction. Easy to say, but figuring out "the right direction" might not be so easy, especially if you're, say, a single mom with no education living in a poor, communist country. What exactly do you expect a person like that to do without some kind of help? Her resume is probably a bit thin, and there are no Wal-Marts in Hong Gai. She could find a job, even if it pays much less than Wal-Mart. Even then she could have better life than she has by chasing your ship. I have learned a bit about the context. to leave her child anywhere but the street. will be able to sustain herself and her kid. Sounds like a better life than chasing the ship for whatever reason? I guess the answer depends on how much she can make as a beggar. I do not want begging to be more attractive than working.